I’ve been a bit of a plain Jane lately. Besides momiform #1, my other go to outfit is the classic T-shirt and jeans combo. Some of you may say that the quintessential t-shirt and jeans outfit is boring but I LOVE it. Something so simple is such a great base to some eye-popping accessories, like a detailed scarf, statement necklace, statement shoes, etc. I especially love the white T-shirt and jeans combo, even if it isn’t baby friendly. It’s crisp, chic and clean (well, clean until baby gets into something). It’s an easy look to put together and on when trying to run errands with baby girl in tow. My go-to places for basic tees are American Apparel (my favorite since they’re not as see through as other brands), H&M, Target (they constantly have deals for $5), and the classic Hanes packets. While the crew neckline is classic and essential for this mommy, I prefer a V neckline, which can be impractical when running after baby girl (not trying to flash anyone here). In my opinion, leopard ballet flats are a closet essential. Rawr! Testing out my camera. Some of my other closet essentials: leopard scarf and a men’s watch. And to dress it up plus keep warm (which is necessary especially at night in the Bay Area), a leather jacket (from H&M a couple seasons ago). What are you closet basic essentials? So there’s been a lack of fashion related slash lookbook (otherwise titled, “The Dressing Room”) posts from my blog. Why?!? 1. I work from home and lazily hangout in my PJs/yoga pants all day with my laptop in my lap. I try to change sometimes, but “changing” means putting on leggings and a tunic. 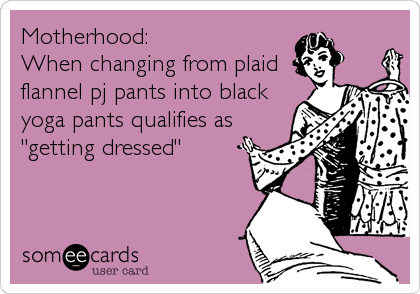 Not much of a departure from the PJs or yoga pants. 2. When I do go out to run errands with Eva in tow, getting dolled up with heels, accessories, and a purse is NOT practical. Pre-baby me would be frowning down upon me right now. Alas I have worn the same thing over and over again whenever I step out. My momiform (Mommy Uniform), if you may, which isn’t a bad thing. Functional and practical is key, especially with a 9 month old mobile baby. I’m featuring Momiform #1: Leggings, T-Shirt or Tank with an oversized blazer or cardigan and flats. It’s easy to put together when you’re trying to run out of the house with a baby (which always seems to be 30 minutes after I say I’m going to leave the house). I’ve tried to dress up said outfits with jewelry or a scarf but even that is impractical at times, as Eva grabs and plays with it while I’m carrying her around. Any time I’ve worn a scarf or necklace, she starts pulling on it, which has prompted me to stop wearing my beloved necklaces hubs has given me in fear of them breaking. And to top it off, I’ve worn hoop earrings while carrying her (I know some of you are already saying “Oh no!” and flinching right now) and she got a hold of them. Thank goodness we were home and I reached for her hand as soon as I felt her grab them. Seriously, THANK GOODNESS! So to dress up my Mommy Uniform, my go-to accessories are statement shoes or stacks of bracelets or rings (which Eva thinks are toys, but these accessories are better to wear as she won’t be tugging at my neck or ears). I’m craving a TON of cute flats right now. So many options, I can’t seem to narrow my choices down. Here are the details of what I wore to the South Bay Bloggers meet up. Necklaces: Anchor necklace from Melrose Trading Post & Cross pendant – gift from aunt, past present future pendant – gift from hubs, and dad’s wedding band. Do you have an outfit you constantly wear? Mommies, what are your stylish yet practical and functional fashion tips? I haven’t done one of these in a while. I’m planning to do this weekly again. For now, here are a couple of things I’ve been loving lately. Since this faves list isn’t just for a week, it may be longer than usual. Statement flats. This mama has been wearing nothing but flats lately. The pre-pregnant me is probably laughing at me right now saying “just because you had a baby doesn’t mean you have to wear flats.” Alas Eva is so mobile and when bringing her around in a stroller or carrier, flats are a bit necessary. The flats at Target have been on point lately, so I snapped up two. 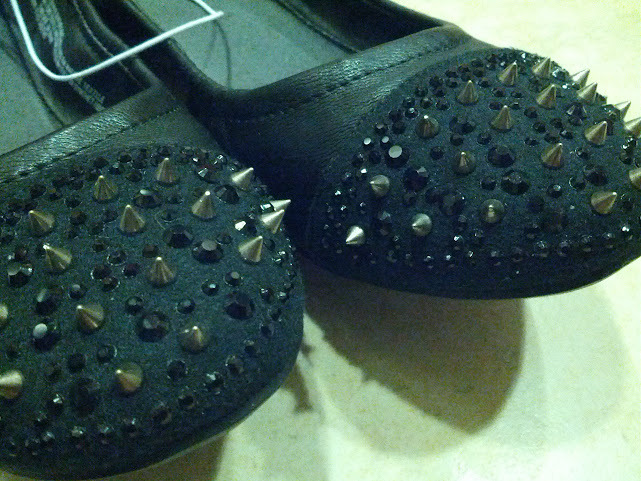 I loved spiked shoes; however, didn’t want spikes all over and wanted something a bit more subtle. These are perfect! And then I wanted a punch of color, so I got coral flats with gold studs. Love! Side note: I know flats aren’t comfortable and don’t do anything for the arch of your feet, so I insert my SuperFeetinsoles into all my flats per the recommendation of my doctor. They’ve alleviated most of the pain I was having at the ball of my feet. 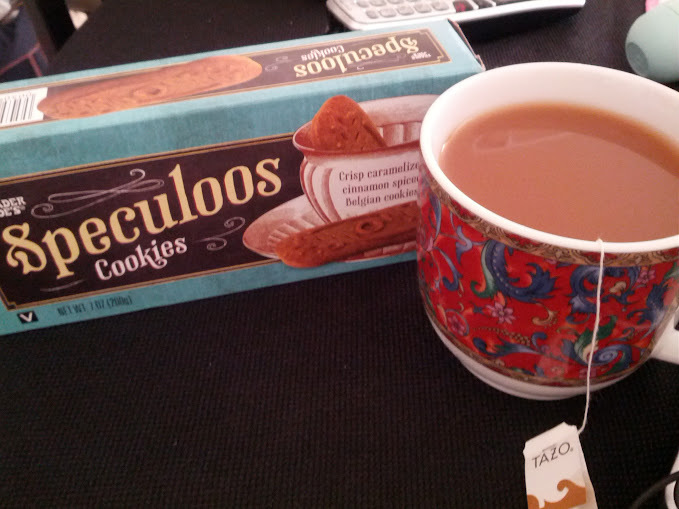 Speculoos Cookies. So happy Trader Joe’s brought these back. Although I feel like these crumble easier than before. (These cookies are a knock off of Biscoff cookies.) These are so great to have with your afternoon tea or coffee. Cinnamon Bread. I’m OBSESSED with cinnamon bread lately. The SemiFreddi’s cinnamon twist bread you can purchase from Trader Joe’s or from Greenlee’s are SO SO SO GOOD. It’s my “sweet” snack indulgence. YUM! Naturebox. I’m LOVING this snack subscription. I’ve been trying to eat healthier snacks, so this has been helpful. You are sent 5 full size snacks to try out. Their dark chocolate almonds are delish! Try it out! You can get $5 off if you type in HEALTHY upon checking out. Haircut. While my hair is a bit shorter than I’d like, it was so necessary. My hair was getting long and felt like it was thinning due to the postpartum hair loss. Not to mention Eva yanks my hair constantly, so it was looking a bit limp and unhealthy. I LOVED going to the salon. A little me pamper time plus I just LOVE my hair stylist. I’m still trying to figure out how to style it since it’s shorter than usual. Although their hair is shorter than mine, my favorite look is curling it for some beach wave/boho look, a la Nicole Richie or Vanessa Hudgens. Loreal TruMatch Crayon Concealer. I’m always on the hunt for a good concealer. I’m hitting the big 3-0 soon plus this momma doesn’t always get a lot of sleep, so concealer is my beauty must have. I love this concealer; however, I do wish they had a wider range of colors. I had to purchase two to blend together to match my complexion, but I did get a BOGO deal, so I shouldn’t complain. Eva learning how to clap. Anytime we say “yay” or start laughing, she starts clapping and tries to sound out “yay.” It’s amazing how excited we (the hubs and I) get when she learns something new, no matter how small it may be. This age is so great. 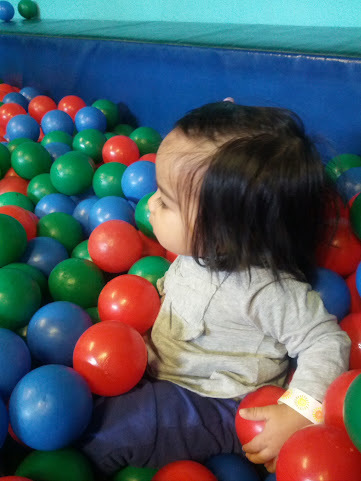 Her curiosity can be tiring (she gets into EVERYTHING), but it’s fascinating to see her facial expressions as she takes in new things. You start to appreciate how things are second nature for us, but for babies it’s all so new. Family naps. The three of us took a nap for 2 1/2 hours one Sunday afternoon. I woke up knowing we all needed to get up, but I really think all of us could’ve slept for another hour. Lazy Sundays are the best. Meeting fellow parents. One afternoon we decided to bring Eva to the park after work and met a mom with her two daughters, one of them was Eva’s age. We approached them as they were around the slide, which Eva wanted to go down, and chatted them up. Before having Eva, my sister in law mentioned it was a bit easier to talk to other moms and dads. We didn’t really get it, until now. You’re all going through or have been through the same situations, so you sympathize with one another. It’s nice to meet families with kids the same age, especially since most of our friends in the area are single/married with no kids. Not only do we make friends, but so does Eva! They were so nice that they even invited us to their youngest’s first birthday party.